Hi, Y’all. It seems I cannot get my fill of Mexican food this month. It started with a craving for Green Chicken Enchiladas. I couldn’t remember my recipe but came up with one that was delicious and simple. My husband loved it too. Then for Cinco de Mayo I did the Chimichanga feast You can see that recipe and pictures of the kiddos digging in here. This week I wanted enchiladas again. I only had red sauce on hand and decided it would be different, so I gave it a go. Preheat oven to 350. Spray pan. pour a little bit of the sauce ( coat the bottom) into the pan. In the bowl of chicken add the sautéed onion, 1/2 of each cheese. and about a third of the sauce. mix well adding more sauce if needed until well coated. put dollops of chicken on each tortilla and roll like a burrito. Lay single layer in the prepared dish. Cover with remaining sauce, bake 20-30 minutes. Enchiladas will start to crisp on the edges and be hot inside. Add cheese bake for 2-3 more to melt cheese take out and let stand a few minutes. Serves 4-6 depending on tortilla size and how much mixture you put in each one. 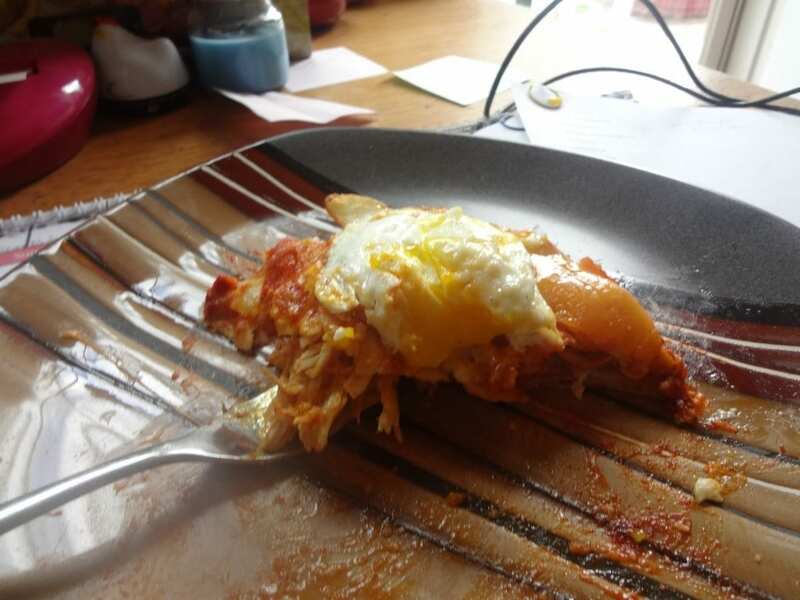 Hubby and I eat just 3-4 of these as a main course and I eat the leftovers for lunch and breakfast: They are awesome heated with a fried egg on top. For feeding a family, you could serve with rice and beans for a full meal. There are so many ways to make enchiladas. I doubt I am done. Beef ones are calling for me. I saw a shrimp one on Pinterest that looked good as well. Do you like enchiladas? What is your favorite? Do you prefer the red or green sauce? Remeber~~If you can dream it ~~You can do it. wasn’t as good as the green ones but it was better than I thought.